Hull length: 4.2 m Hull width: 0.85 m Draught: 1 m Sails area: about 7 sq. m Mass: 260 kg Crew: 1 person / max 130 kg Designer: Marek Jankowski M. Eng. The Proton has been designed and manufactured according to "International 2.4 One Design Class Rules" document. This Class is well-known in the worldwide sailing -- since 1999 European and World Championships of the 2.4mR were sailed with participation of more than 100 keelboats. We are able to deliver the Proton 2.4 mR with "Certificate of 2.4mR Class Yacht" and the ISAF Building Plaque. Both these elements entitle the contender to take part in international regattas. The Proton is ideal also for the helmsmen of the other Classes to train regatta tactics as well as to improve sailing technique. It is caused by the fact that this keelboat gives wide possibilities of rigging adjustment and there is no need to hike out by contender. Noteworthy is also the fact that this kind of training does not require numerous crew. The Proton has been prepared to sail in heavy weather conditions. Her very durable hull made of glass reinforced plastic has specially strengthened structure which guarantees full safety. The keelboat deck is sandwich-type construction enhancing its strength and stiffness. The keelboat is uncapsizable thanks to keel filled with lead and unsinkable because she has the flotation tanks filled with foam material. Two bilge pumps complement the Proton equipment -- one of them is electrically driven, the other one is hand-operated. Top level of ergonomic solutions was one of main designer's attention in the process of Proton research and development. The helmsman's seat is forward and backward adjustable and the angle of backrail is adjusted separately as well. All the ropes of rigging are accessible within reach and they are belayed very easily and securely. Rudder controling is very easy thanks to dual system of rudder pedals or hand-operated tiller located in front of helmsman. The rudder pedals have unique double adjustment system where both angle of pedals and their distance from helmsman's seat are adjusted. Sailing by the Proton is extremely exciting. The keelboat is very fast and handy. She gives the feeling of sailing by seagoing ballast yacht. High inclinations and helmsman's head situated just over the waterline bring unforgettable experience of sailing. Our company sells complete, ready to sail, 2.4mR keelboats. They are equipped with the sails, entire hardware and ropes. 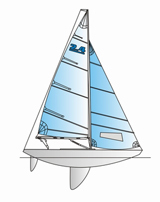 Except for Standard version also Regatta model is available with her much extended rigging adjustment. In order to see both versions of the Proton specification click here. Together with the Proton you can buy also keelboat trolley with folding up wheels. This gear is very useful for short-distance transportation and for keelboat storage.